The State University of Tetova, is located in the North Eastern part of the R. of Macedonia, more precisely in the city of Tetova. This HEI was founded. 1 The State University of Tetova, is located in the North Eastern part of the R. of Macedonia, more precisely in the city of Tetova. This HEI was founded back in 1994. At the very beginning, due to the oppression made by the Government, the University initiated its work in private houses located in the city itself and in the villages around. It kept working under wretched conditions for a time of ten years until, as a results of the “winds of changes” engulfing Education as well, finally became legalized in 2004. Since ever, the University has been working on creation of better working conditions, which resulted with the inauguration of the new University Buildings, just less than a year ago. 2 City’s Location The city of Tetova is located cca 40 km North-West of the Capital Skopje and is know as the City of youth, Education, winter sports and many other cultural, political and economical developments for this part of the Country, populated predominantly by ethnic Albanians. 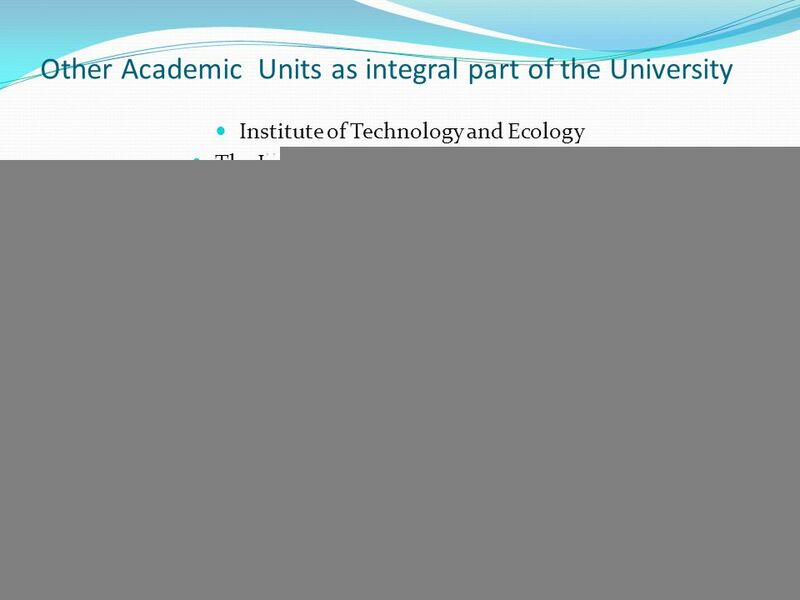 4 Other Academic Units as integral part of the University Institute of Technology and Ecology The International Seminar of Albanology The Language and Instructional Support Center of the University ( LISC-UT ) The State University of Tetova in numbers: Currently the University has 15.000 Students, and has the tendency of growing each year Languages of Instruction: Albanian Language as the first language of instruction Macedonian as a language of instruction in some faculties English as the language of Instruction at the English Department of the Philological Faculty, currently being introduced in some of the most attractive departments of the University as a need of the Globalized HE in the region and in the international context. 5 Learning and researching environment at SUT (State University of Tetova ) Within the time span of its life and development, the SUT, has created optimal conditions for learning and researching for both, the staff and the students. The University has short, but rich and intensive studying and researching activity, involving u=hundreds and thousands of its students as well as some international teaching and research staff. All these activities are carried out at its institutes and are supported by the University’s Library which is basically equipped and has a good fond of books both in paper as well as electronical form. All faculties have well equipped labs, where research and learning can be conducted. There is a range of activities taking place such as research presentations, lectures as well as seminars and conferences in each faculty, where staff and students are invited to present or attend the news from various foelds of science, according to their interest. 6 International cooperation of the University Since its legalization back in 2004, the University has recognized a good record of international involvement This involvement has comprises participation in various projects of international, regional as well as local character, dealing with new trends in teaching methodology as well as research and innovation, in respective fields of science. In terms of international cooperation, the University of Tetova, has been involved in a dozen of Projects of the EU Commission, managed by the EACEA, from the schemes such as Erasmus Mundus, Erasmus, Tempus, LLP etc. The University has signed contracts in scientific cooperation with dozens of Universities in the Region and wider, in the field of staff and student mobility, as well as research and innovation as priority of its developing long run strategy. 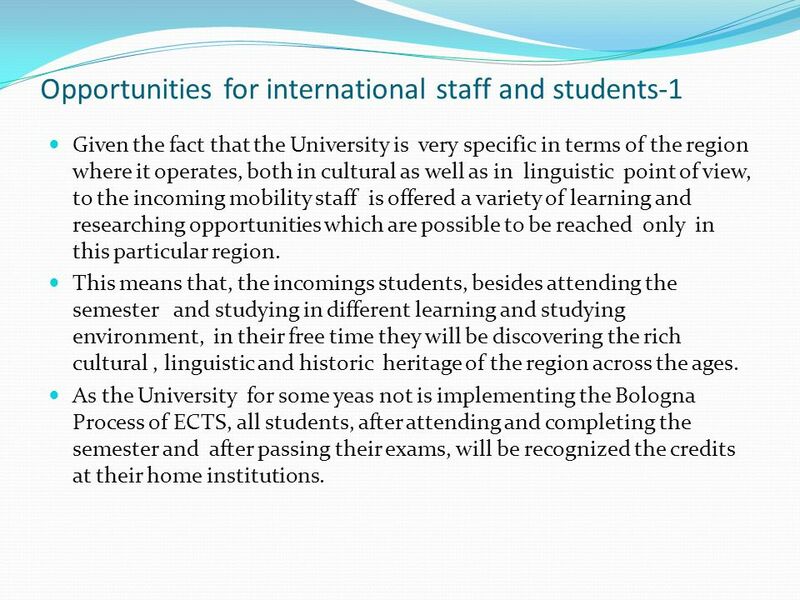 7 Opportunities for international staff and students-1 Given the fact that the University is very specific in terms of the region where it operates, both in cultural as well as in linguistic point of view, to the incoming mobility staff is offered a variety of learning and researching opportunities which are possible to be reached only in this particular region. This means that, the incomings students, besides attending the semester and studying in different learning and studying environment, in their free time they will be discovering the rich cultural, linguistic and historic heritage of the region across the ages. As the University for some yeas not is implementing the Bologna Process of ECTS, all students, after attending and completing the semester and after passing their exams, will be recognized the credits at their home institutions. 8 Opportunities for international staff and students-2 As to the incoming academic mobility staff, the University offers good opportunities to work and teach in a completely new environment, where their expertise will be welcomed and respected by the lectures who will bring a new approach of teaching and learning to its students. The incoming students as well as staff will be offered courses of immersion into a basic communication in Albanian, as one of the oldest languages of the region and wider. These courses will be offered by the Language center of the University. Those coming from Humanitarian sciences will be offered courses from the Albanian civilization and culture in general, getting this old culture and language closer to them. 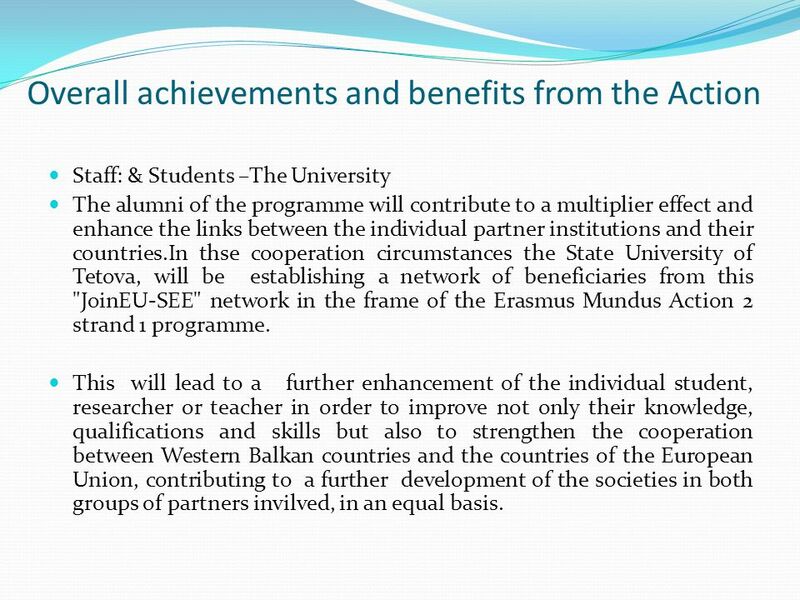 9 Overall achievements and benefits from the Action Staff: & Students –The University The alumni of the programme will contribute to a multiplier effect and enhance the links between the individual partner institutions and their countries.In thse cooperation circumstances the State University of Tetova, will be establishing a network of beneficiaries from this "JoinEU-SEE" network in the frame of the Erasmus Mundus Action 2 strand 1 programme. This will lead to a further enhancement of the individual student, researcher or teacher in order to improve not only their knowledge, qualifications and skills but also to strengthen the cooperation between Western Balkan countries and the countries of the European Union, contributing to a further development of the societies in both groups of partners invilved, in an equal basis. 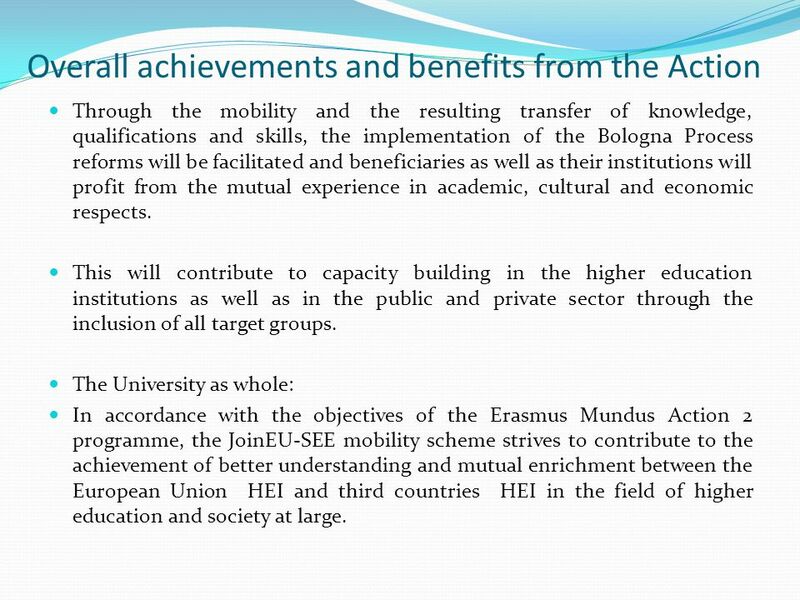 10 Overall achievements and benefits from the Action Through the mobility and the resulting transfer of knowledge, qualifications and skills, the implementation of the Bologna Process reforms will be facilitated and beneficiaries as well as their institutions will profit from the mutual experience in academic, cultural and economic respects. This will contribute to capacity building in the higher education institutions as well as in the public and private sector through the inclusion of all target groups. The University as whole: In accordance with the objectives of the Erasmus Mundus Action 2 programme, the JoinEU-SEE mobility scheme strives to contribute to the achievement of better understanding and mutual enrichment between the European Union HEI and third countries HEI in the field of higher education and society at large. 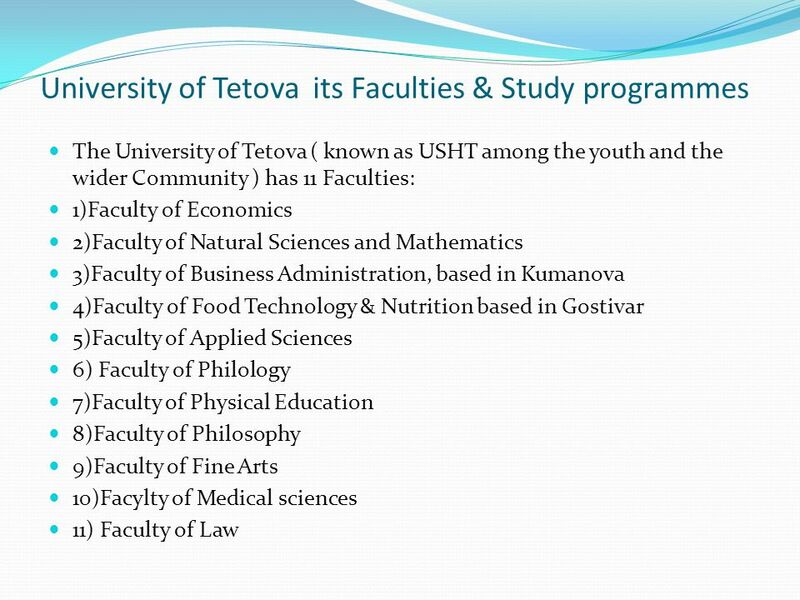 Download ppt "The State University of Tetova, is located in the North Eastern part of the R. of Macedonia, more precisely in the city of Tetova. This HEI was founded." Education & Training 2010 : Are we on track with the Lisbon goals ? ACA, Brussels, 6 February 2004 Dr Guy HAUG European Commission. Introducing Gordon College of Education. Gordon College of Education, Haifa Founded 1953. University of Sarajevo Bosnia and Herzegovina. Country: Bosnia and Herzegovina Flag: Capital city: Sarajevo Nicknames: Jerusalem of Europe, Jerusalem. TEMPUS SCM Form N. C032B06 West Balkan Bologna Promoters Network Podgorica September, 2007. Erasmus Mundus November 20, Erasmus Mundus – Programme objectives: Promote European quality offer in higher education. Date: in 12 pts Education and Culture Capacity Building in the field of Higher Education. TEMPUS SCM Form N. C032B06 West Balkan Bologna Promoters Network Bratislava, February 2008. Bologna and the Third Cycle Anthony J Vickers UK Bologna Expert. ERASMUS MUNDUS. GENESIS 3Article 149: Enhance quality education 3Lisbon, Bologna/Prague, G8... 3Communication on reinforcing co-operation with third countries. | Mobility in Europe – The Austrian Experience | Gerhard Volz | 26/06/ Mobility in Europe – The Austrian Experience with. University of Zadar Facts and figures 2010/2011. Geographical position of Zadar and Croatia.